Pensionskassernes Administration (PKA) and Pension Forsikringsaktieselskab (PFA) will each buy a 25% ownership in the project in the Irish Sea. The combined cost of the purchase prices and PKA and PFA's commitments to fund 50% of the payments under the engineering, procurement and construction (EPC) contract amounts to approximately £2 billion (€2.27 billion), Ørsted stated. This will be paid during 2017 and 2018. Dong Energy rebranded as Ørsted last month. The developer announced the divestment alongside its financial results for Q3 2017. Its underlying operating profit was 10% down on the same period last year, but its earnings from operating offshore projects increased by 39%. This increase was attributed to Q3 being the first full quarter in after the 258MW Burbo Bank Extension came online. Following the sale of the Walney Extension, Ørsted revised its earnings before interest, tax, depreciation and amortisation (EBITDA) outlook for the year increased from DKK 17-19 billion (€2.28 - €2.55 billion) to between DKK 19-21 billion (€2.55 - €2.82 billion), it said. The Walney Extension wind farm is split into two tranches, East and West, and is due online in the second half of 2018. Walney Extension West comprises 40 of MHI Vestas' V164-8MW turbines, while the East site will comprise 47 of Siemens' SWT-7.0-154 turbines. "We already have a strong partnership with PKA on three other offshore wind farms (Burbo Bank Extension, Gode Wind 2, and Anholt) and we look forward to building an equally long-lasting relationship with PFA on what will be the world's biggest wind farm when completed," said Ørsted CEO Henrik Poulsen. 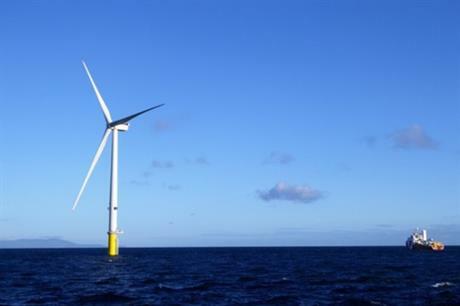 In a media call, CFO Marianne Wiinholt revealed the 2.4GW Hornsea Project Three site, located off England's east coast, would not be ready for the next contract for difference subsidy auction (CfD) planned for spring 2019, but it would be ready to compete for government support later that year. The developer's 1,386MW Hornsea Project Two site won support in the most recent CfD auction in September. Ørsted expects a deal to sell 50% of its 450MW Borkum Riffgrund 2 to Global Infrastructure Partners (GIP) would be completed by the end of the year. Elsewhere, it is looking at "all renewable technologies" for future investment and development, including electric vehicles and energy storage. Finally, it expects its 128MW Formosa 1 project off the coast of Miaoli in north west Taiwan to complete its environmental impact assessment by the end of 2017. Ørsted opened an office in Taiwan just under a year ago.